Online ordering is for shipping by usps to a familys home. For local delivery to a funeral home, you must call the store to order this product. 724-861-8180. Music Box is velvet lined, includes a hand crank music mechanism and plays a popular song! 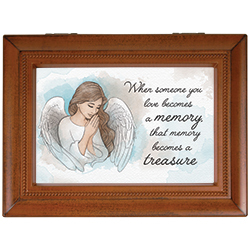 All sentiment cards can be replaced with a personal photograph.Plays “Amazing Grace”. D: 2.75″Please let us know in the notes section of check out, how you would like your card to read.For instance, May you have happy memories of your sister when you hear the tune. Love, The Jones family.